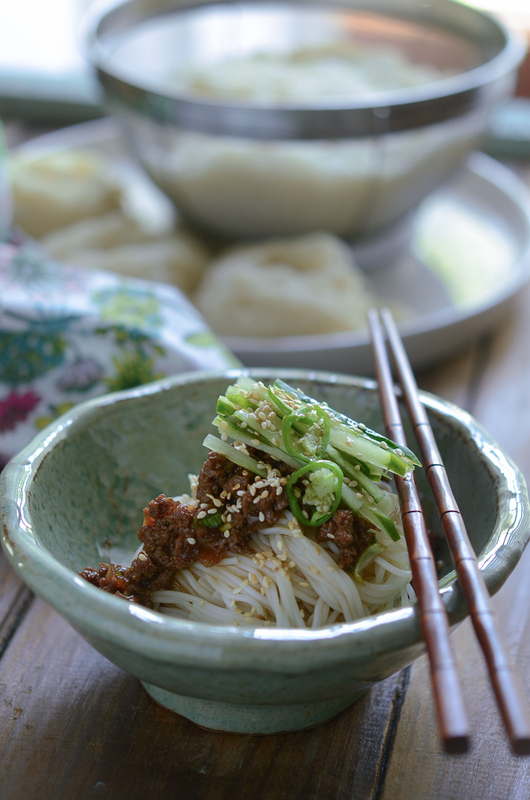 Here is another simple recipe that you can make with the Korean beef sauce that I used for Korean noodles with beef sauce. I found these snake beans at the market. 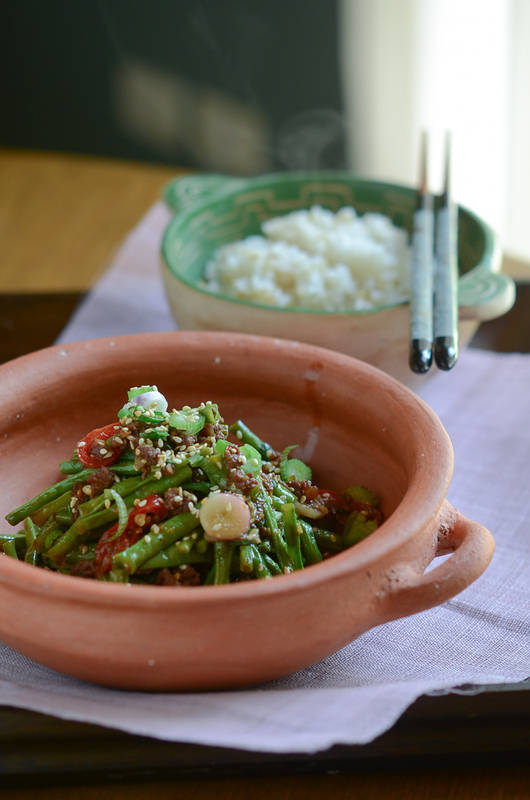 I stir-fried these beans with the beef sauce and the result was delicious. 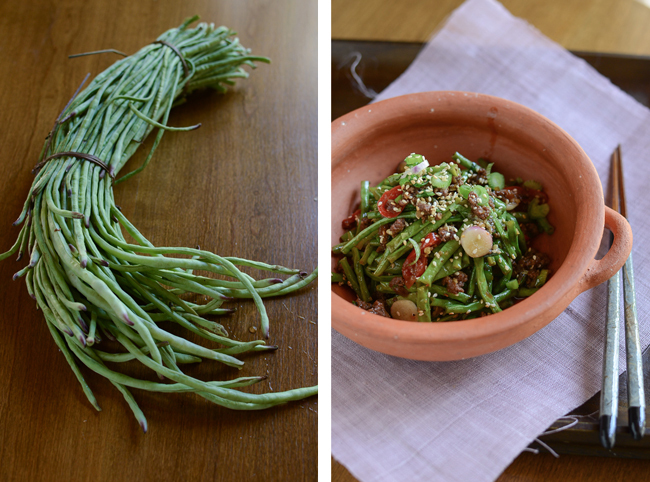 If you don’t have snake beans, you can use sliced green beans instead. I would recommend to slice thinly diagonally if using green beans. 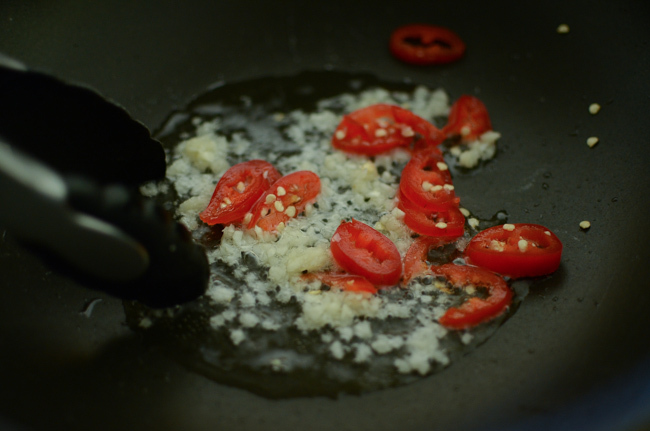 First, you cook garlic and red chili in oil for 10 seconds. 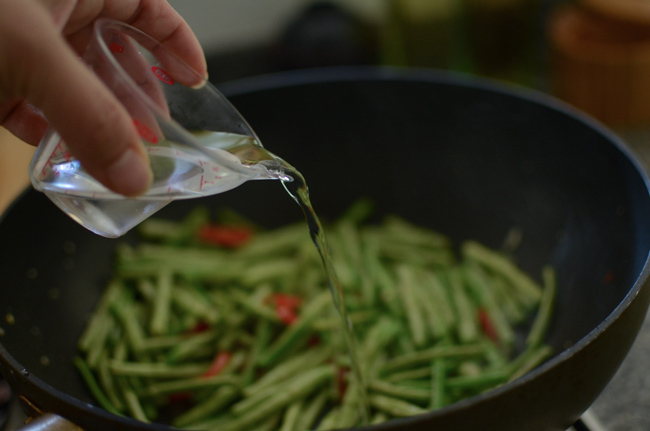 then cover with the lid and steam the beans for 1-2 minutes to soften. When the beans are crisp tender, add the beef sauce and toss. That’s all. 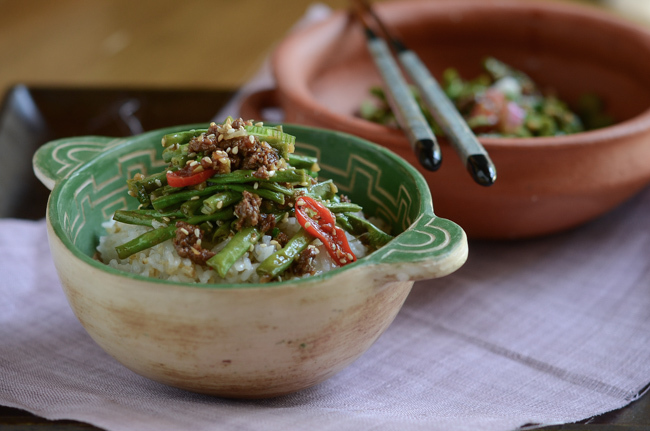 A simple stir-fry in less than 10 minutes. Now that is quick, don’t you think? Pile up high on your rice bowl and dig in. You will be able to finish a bowl of rice in no time. I love dishes like this for a simple lunch. Make my day less hectic. I hope you can enjoy this. So here is the recipe! 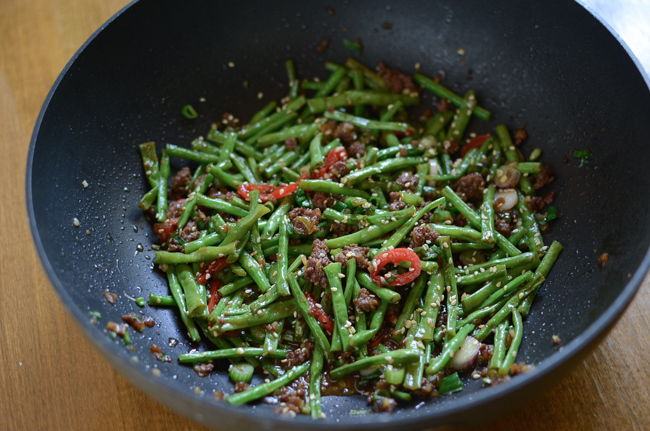 Quick and simple stir-fry with snake beans (or green beans) and simple beef sauce. 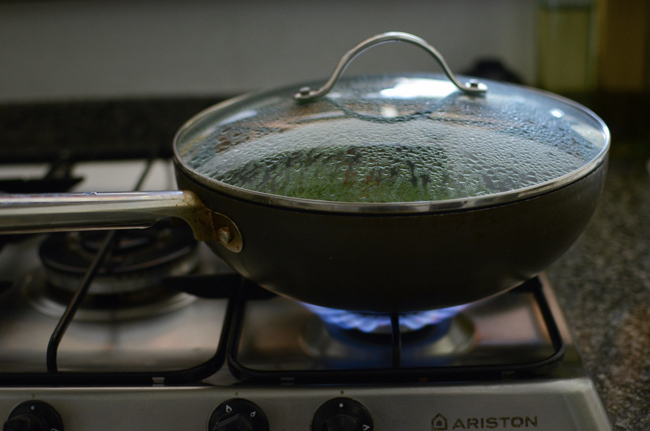 In a skillet or wok, heat oil over med-high heat. Add the garlic and chili and cook for 10 seconds. Add the beans and toss. Sprinkle 2 tablespoons of water and close with the lid and let the steam to cook the beans, about 1-2 minutes, until the beans are tender crisp. If the beans are still to crunch, add the rest of the water and repeat the steaming. Adjust the heat so you don't burn the garlic. When the beans are tender crisp, add the beef sauce and toss. 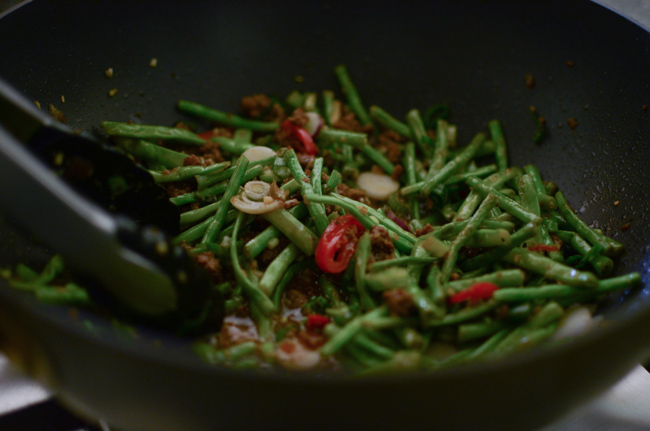 I see those beans in Asian markets, but have never cooked with them. Next time I see them I'll get them, and use them in this! Really good stuff -- thanks.